It seems to be the latest craze in eye-fashion, but what is it all about, why the fuss? To understand blue light, you first need to understand light, where it comes from and how we “consume” it? Throughout evolution, man has typically been exposed to roughly 12 hours of light and 12 hours of darkness in an average day, and our brain has become used to this. Historically, we have received this “light input” during those daytime hours, with the greatest source of all light being the sun. As we all know, the energy and intensity that the sun gives off is very strong or “high in energy”, evidenced by the fading that carpets and curtains experience when in constant sunshine, or that familiar burnt red feeling most of us Brits experience when on a hot holiday!! This light is most commonly referred to as UV light, of which there are 3 types – UVC (100-279nm), UVB (280-315nm) and UVA (315-380nm). It is really the UVA light that we need to worry most about, as all of UVC and most of UVB is filtered out by the ozone layer. UV light, in addition to the damage it can do to our skin, also has implications on our eyes – the most common condition being cataracts due to not protecting our eyes enough from this harmful light. The ground we are standing on; different surfaces reflect light at varying intensities, with grass being the least reflective (only 3% of light is reflected back up off the ground) to fresh white snow (where 80% of the light is reflected back up). These points all start to help us understand how light behaves. The amount of light, as well as the “angle” at which light penetrates our eyes all influence our exposure. In short, it is important to protect our eyes and even more important in those circumstances where risk of UV over exposure is even higher. So, let’s get onto blue-light, which can be separated into “blue violet” and “blue-turquoise” light. These 2 wavelengths on the light spectrum are immediate neighbours to UV light. Blue-violet (380nm – 450nm) light is generally considered to be harmful (still very high in short wavelength energy and intensity) whilst blue-turquoise (451-495nm) on the other hand, has certain beneficial properties, not least that it helps regulate our “circadian rhythm” – the cycle that manages our sleep / awake patterns and certain positive cognitive functions. The long-term impacts of being over exposed to phototoxic blue violet light are still being understood, with the clinical evidence thus far being limited to a few retrospective epidemiological studies. However, there is strong preclinical evidence of ocular blue light toxicity obtained from in vitro and in vivo studies. It has been demonstrated that A2E, a photosensitive fluorophore of the waste product lipofuscin in retinal pigmented epithelium (RPE) cells, is responsible for blue light-induced phototoxicity. A2E is excited by blue light and generates reactive oxygen species, leading to cell death in RPE cells and ultimately to photochemical damage. There is also suggestion that an over exposure to blue violet is a contributory factor (amongst a few other factors also) to age-related macular disease. So, in short summary, in “managing” our blue light exposure, it is important to reduce the blue-violet whilst maximising the blue-turquoise. “Why now” you may ask? As far as the sun is concerned, we take in blue light in exactly the same way as UV light. If we have been consuming it for billions of years, what environment factors have changed that have increased our risk today of over exposure? The simple answer lies in 2 key differences in our lives vs those of our ancestors. The first is change in lighting technology towards artificial, low energy light bulbs, that are rich in blue light emitting diodes compared to the traditional incandescent light bulb. We are in fact, constantly surrounded by this phenomenon in lighting all day long – kitchens, bathrooms, lounges as well as in offices and workplaces, and it is estimated to constitute over 90% of all artificial lighting in the world by 2020. There is also an additional contributory effect resulting from our constant use of digital devices, in short – we cannot escape blue light. The second difference is our access to light at any time of the day, which is significantly higher than many years ago – for example late at night. The beginning of this article referred to the historic 12 hours of daylight, 12 hours of darkness, but with blue rich lighting often surrounding us long after the sun has gone down, which is further supplemented by our reliance on modern day digital devices. Indeed, when further consider that our life expectancy is ever increasing, it is quite reasonable to conclude that our lifetime exposure to blue light is as great as it has ever been. Whilst our learning is in its infancy, it would seem prudent, based on the preliminary evidence, to minimise the amount of blue violet light we are exposed to, much in the same we try to limit the exposure to UV light. Considering the ever-increasing role of blue-rich artificial lighting and digital devices in our personal and professional lives, reducing our exposure to blue light considerably does not seem very realistic. Whilst the spectacle lens manufacturers started to innovate in this arena a few years ago, until now no solution has existed in contact lenses. 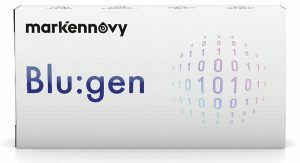 This changed with the introduction of Blu:gen by mark’ennovy, a silicone hydrogel contact lens with both a selective blue light filter and a Class 1 UV filter – a world’s first. Blu:gen blocks at least 14% of blue light, 93% of UVA, and 99% of UVB light. What’s more, offering an exceptional combination of parameters and geometries, Blu:gen can cater to almost any eye shape and size, ensuring a perfect fitting contact lens for every patient. And for the younger wearers, there is a special seasonal packaging as well! Blu:gen is a silicone hydrogel lens, combining a Class 1 UV Filter with selective Blue Light Blocking to protect the eye from upwards of 99% of UVB, 93% of UVA, and 14% of harmful blue-violet light.